Most ovarian cancer is discovered at an advanced stage, responds to standard treatments of surgery and chemotherapy, and then relapses. Unsurprisingly, the better the job of surgically removing tumors, the better the patient’s prospects. This month in PNAS, MIT’s Angela Belcher and colleagues described a near-infrared imaging system based on an injected nanodevice combining carbon nanotubes with peptides that latch onto ovarian cancer cells, assembled neatly via synthesized bacteriophage virus. 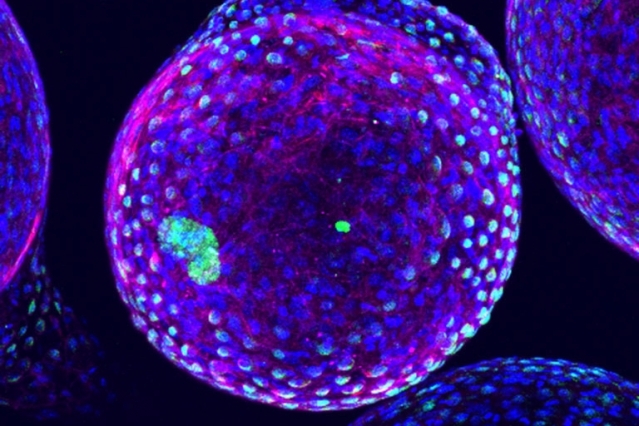 In an early surgical test on mice, the technique proved very effective at detecting tiny clumps of cancer cells. Presenting her work last week at an ovarian cancer event at the Koch Institute for Integrative Cancer Research, Belcher noted that this imaging technique currently works through about 10 cm of tissue, which covers a lot of territory in the human body. She hopes that the method can be extended to gather molecular information about tumor cells that could aid in treatment. Also at the Koch event, which drew a mix of survivors and researchers, Belcher’s MIT colleagues Sangeeta Bhatia and Paula Hammond presented their ongoing work on cancer nanotherapies. Bhatia and co-workers are developing nanodevices in which various types of short interfering RNAs (siRNAs) designed to attack cancer tumors can be wrapped inside peptides configured to penetrate tumors and pass through cell membranes. Years of painstaking work are paying off in dramatic results in mice models. Hammond and her research partners take another approach to cluster-bombing cancer (see cartoon below). 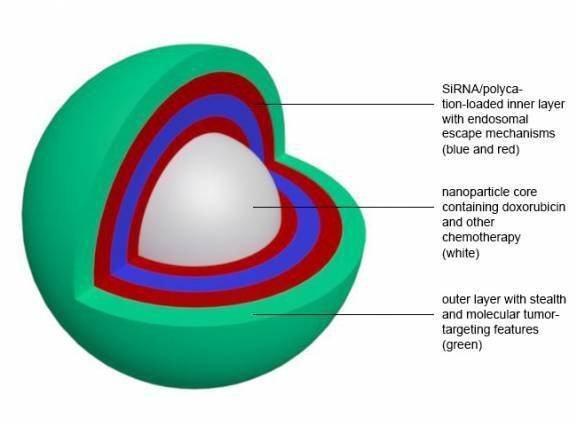 They assemble nanoparticles layer by layer, starting with a core of doxorubicin or another chemotherapy agent, adding layers of siRNAs and topping off with a “stealth” outer wrapping meant to let the nanoparticles glide through the body until they can glom onto cancer cells. All very promising, all in early animal research, and the survivors at the Koch event kept politely asking when each advance might reach humans. “We’re still vertical,” one survivor pointed out.